The firm Grimme, Natalis & Co (GNC) was established in 1871 to build sewing machines and domestic appliances at Braunschweig (Brunswick) in Germany. 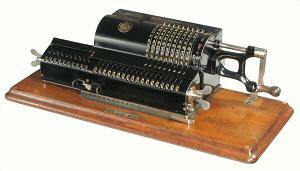 In 1892 engineer Franz Trinks was instrumental in securing the German manufacturing rights for the Odhner pinwheel calculators. The first machines were built according to W.T. Odhner's 1890 design, and were distributed under the brand name "Brunsviga". 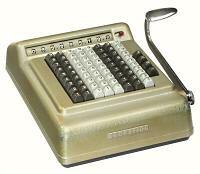 Trinks continued to develop and refine the Brunsviga calculator over a period of almost 30 years. Between 1905 and his retirement in 1925 he received over 40 US patents, and was awarded an Honorary Doctorate by the Braunschweig university. The "new Brunsviga" range appeared in 1925, and the "13-series" in 1927. 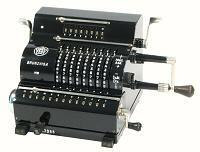 The range continued to expand with a portable stepped-drum machine in 1932, and a full-keyboard adding and listing machine in 1936. Production resumed after the 1939-45 war with a new range of 13-series machines, a motorised version of the stepped-drum machine, and a range of small adding machines. Grimme, Natalis & Co was originally established as a "Commanditgesellschaft auf Aktien" ("C.a.A." on the logo, meaning an association with shares). On its fiftieth anniversary in 1921 it became Grimme, Natalis & Co AG (Aktiengesellschaft, or corporation). In 1927 the name was changed to "Brunsviga Maschinenwerke Grimme, Natalis & Co AG", and later to just "Brunsviga Maschinenwerke AG" (Brunsviga Machine Works). In 1957 Brunsviga entered into an agreement with Olympia Werke AG of Wilhelmshaven (part of the AEG group), which led ultimately to the company being absorbed into Olympia in 1959. Production continued for a time as the Brunsviga Division of Olympia, before coming to an end in the late 1960s. 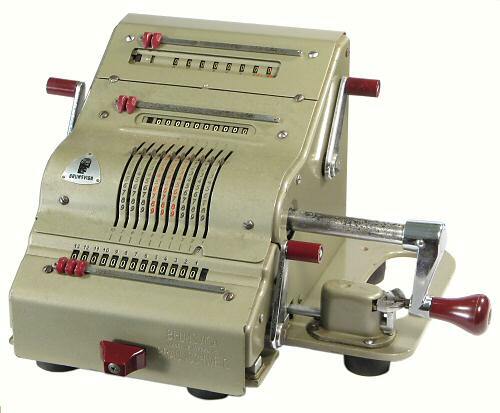 About half a million Brunsviga machines were produced over a period of almost eighty years. The illustrations show a selection of Brunsviga machines collected from sources within Australia. Click on the photos or links for larger illustrations. 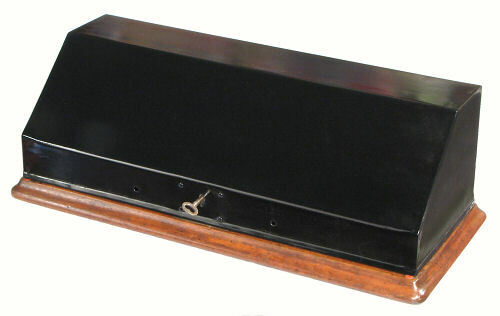 A Model A Brunsviga on a wooden base with a sheet-metal cover. The Model A was produced in several versions from 1895 until about 1920. The machine illustrated is a very early model from about 1898. The machine is almost identical to W.T.Odhner's 1890 design, as described in (eg) his US Patent 514725. The brass rotor disks are 71mm in diameter, with the nine setting levers spaced on 9mm centres. 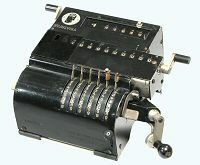 The moving carriage has 10 places in the counter register and 18 in the accumulator, but the tens-carry mechanism only covers 10 of the 18 places. The carriage is positioned manually by releasing a latch and moving the assembly by hand to the required position. The registers are cleared by a full turn of the large wing nuts on either end. The mechanism is very basic, with no safety interlocks and no added features, but is still in good working order after almost 110 years. This rear panel of this machine carries a label from a dealer in the Transvaal (South Africa). It is not known how the machine came to Australia. The Brunsviga Model B is essentially the same as the Model A above, but in the smaller 9x8x13 format. Over 20,000 Model B machines were produced (in several versions) from 1892 until about 1927. This early machine was built in about 1900. The rear panel carries a label from "Bradbury, Wilkinson & Co Ltd, Agents for Great Britain and Ireland". The only significant difference in the mechanism is the addition of two safety interlocks to prevent damage from mis-operation. One mechanism interconnects the rotor with the carriage position so that neither can be moved unless the other is in a locked position. The second interconnects the rotor with the accumulator clearing mechanism in a similar manner. This latter mechanism is somewhat restrictive, in that it only allows the accumulator to be cleared when the carriage is in its leftmost position. The mechanism has been disabled in the machine illustrated. This later version of the Model B (from about 1912) would originally have been fitted with a wooden base and cover, or a cast-iron base with rubber feet. This version includes a rotor quick-clearing mechanism operated by the large wing nut on the left-hand end. The tens-carry mechanism extends across all 13 places. The machine has safety interlocks between the setting rings, the rotor and carriage positions, and the clearing levers. Decimal point indicators are provided on the registers, but carriage positioning is still entirely manual. A well-worn Model J Brunsviga from about 1909. The Model J is a large and heavy machine, in which engineer Franz Trinks made two significant changes to the Odhner design. The most obvious change is that the width of the moving carriage has been reduced by relocating the counter register. The counter is now fixed in position within the body of the machine, just above the setting levers. The counter drive mechanism is coupled to the carriage position by a band-and-roller arrangement, as described in Trinks' US Patent 975180 (filed in 1907). The moving carriage at the front of the machine contains only the 13-place accumulator, which is positioned manually by releasing the latch at the left-hand end. The registers are cleared by a full turn of their wing nuts. The second change is to the rotor and setting mechanism, which uses extended levers that remain fixed in position as the handle is turned. The rotor uses the same 71mm pinwheels, but the spacing has been increased to 13mm to accommodate the additional setting levers. Two small levers on the winding handle switch the mechanism between setting and cranking modes. A setting check dial is provided at the front of the machine, just above the carriage. A rotor clearing mechanism is operated by a turn of the large crank on the left-hand side of the machine. The new mechanism increases the complexity and weight of the machine, as each setting lever operates a train of six separate dials, discs, and gears. The fixed counter register was continued on in most subsequent models, giving the Brunsviga machines their distinctive shape. The lever setting mechanism was soon abandoned, but the rotor check dial, clearing mechanism, and handle-operated locking mechanism were all continued on in various forms. 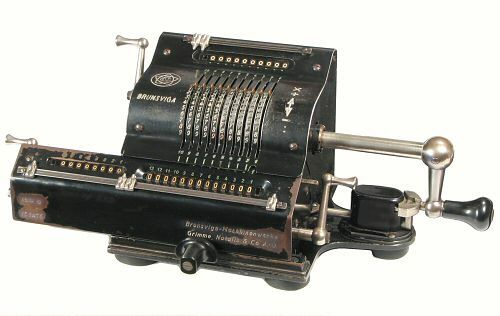 Model MIII from 1925 was the last in a line of "miniaturised" or M-series machines first introduced in 1909. It is much smaller than the Model J, but is still very solidly constructed from cast iron and brass. The counter and carriage frames are machined from solid brass castings that are over 6mm thick. The MIII displays several more of Trinks' inventions which remained as standard features of the Brunsviga range for the next thirty years. The rotor is built from machined brass discs of 56mm diameter, with the conventional setting rings spaced 10mm apart. A lever on the left-hand side operates a quick-clearing mechanism to return the rings to zero. The rotor assembly alone weighs almost 1.5kg. The carriage contains only the accumulator register, with tens-transfer across the full 13 places. A lever at the front can be pushed to either side to move the carriage by exactly one step, or pressed inwards to release the detent and allow continuous movement. Two hard-rubber blocks are mounted at the ends of the base to assist in gripping the lever. The wing nut on the clearing mechanism has been replaced with a short crank, which makes a full turn to clear the register. The overflow bell is mounted externally at the left of the carraige. The counter register is fixed at the top of the machine. It has full tens transfer mechanism, using a separate brass carry rotor of 28mm diameter. Reversal for division is accomplished by using double-width counter dials with the digits and their complements marked side-by-side. An automatic sliding shutter displays only the appropriate set. The shutter is opearated by a rather complex extension of the tens-carry mechanism, which also injects the "fugitive one" on sign change and provides an indication when the counter is clear. This counter mechanism continued in various forms until the end of Brunsviga production. It is described in detail in Trinks' US patent 1445461, filed in 1920. The counter register has a short-stroke clearing mechanism operated by the lever at the top right. Both the counter and the accumulator contain mechanisms to release the detent springs during clearing, to reduce the force required (and the noise generated). The MIII was also sold as the "Rema III", following GNC's takeover of the Rema manufacturer in 1922. The "New Brunsviga" was released in 1925, with several different and innovative "Nova" models. The Nova II was the most popular, with about 10,000 machines produced over the next nine years. The machine illustrated is from about 1930. The Nova II is a very large and heavy machine. The rotor discs are 67mm diameter, with setting levers spaced 8.5mm apart. A check dial is located just above the setting levers. The counter register is fixed at the top of the machine, and has a full tens transfer mechanism. The double-width counter dials have the digits and their complements marked side-by-side, with an automatic sliding shutter to select the appropriate set. The carriage contains the accumulator register, with tens-transfer over the full 15 places. The clearing crank has been replaced with a short lever which is pulled forward and released to clear the register. The Nova II is fitted with a back-transfer mechanism, which is operated by a fourth lever at the left-hand rear of the machine. The mechanism serves to transfer an intermediate result from the accumulator back to the setting levers for use in a further calculation. Back-transfer is a two-handed process, which requires the operator to pull and hold the rotor clearing lever, then pull the (adjacent) back-transfer lever fully forward, and then pull the accumulator clearing lever. The result is transferred as the accumulator returns to zero. 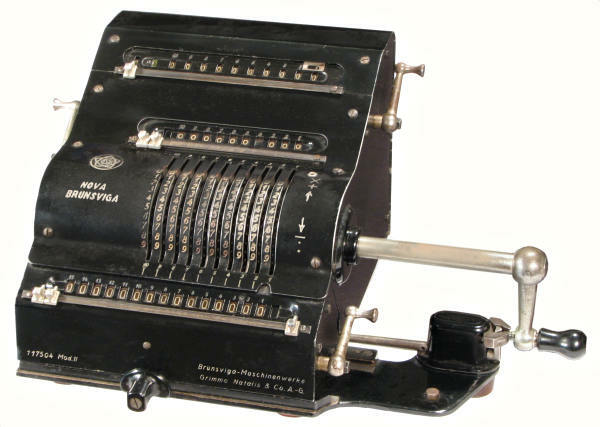 The introduction of the "New Brunsviga" in 1925 coincided with the retirement of chief engineer Franz Trinks, and effectively marked the end of the functional development of the Brunsviga pinwheel calculators. The later 13-series (introduced from 1927 to 1930) differed mainly in the construction details - for example, the 13B (below) from the mid-1950s is functionally equivalent to the MIII (above) from 1925. 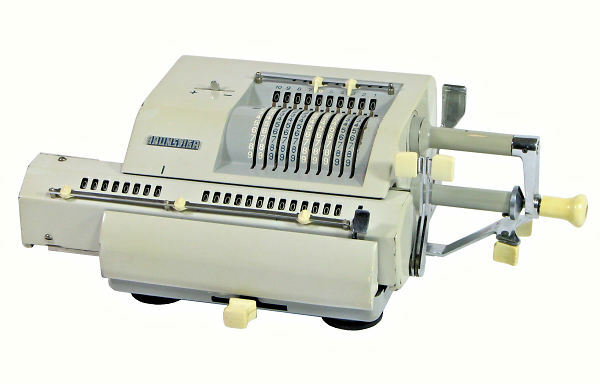 The Nova 13 is a small and rather basic machine in the traditional Odhner format. It was first introduced in 1927; the machine illustrated was built in about 1938. The accumulator and counter registers are both contained in the moving carriage. There is full tens-carry (to 13 places) on the accumulator, but none on the counter. Both registers use Trinks' short-stroke clearing mechanisms. The rotor pinwheels are 54mm in diameter, with the setting levers spaced only 6mm apart. There is a check dial above the setting levers, and a rotor clearing lever on the left-hand side. The 13-series machines in 10 x 8 x 13 format formed the basis of the Brunsviga pinwheel range from the 1930s until the end of production. The illustration shows a well-worn example from the immediate post-war period. Model 13ZK has a setting check dial above the rotor, with the counter register at the top of the machine. The "Z" indicates that the counter has full tens transmission. The "K" signifies a coupling mechanism which allows various combined clearing operations. The counter clearing lever can be set so that it will also clear the setting rings, to save time in accumulating totals from repeated multiplications. A master clearing handle (centre right) clears the setting rings and all of the registers, and prepares the machine for a new calculation with just a single operation. A carrying handle is incorporated into the extended baseplate on the right-hand side. 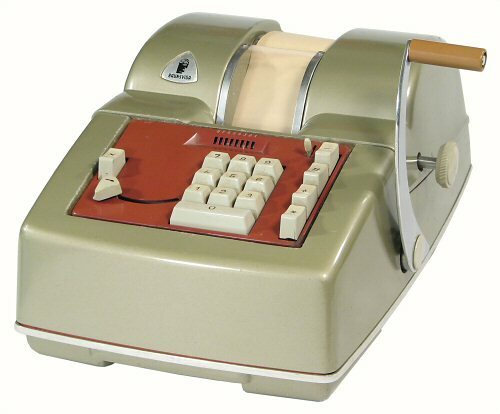 The 13-series machines were re-styled for the 1950s, but there were few changes to the mechanisms. This Model 13Z from the 1950s is basically identical to the 1930s 13ZK (above), but without the coupled clearing mechanisms. The 13RK is quite a highly-developed machine which has a full set of features to make life easier for the operator. It includes the setting check dial, tens transfer on the counter, and the coupled clearing mechanisms from the 13ZK. The carriage shift control (centre front) is replicated in the double-sided lever under the main operating handle, so that most operations can be accomplished with the right hand alone. The "R" in the model number signifies the back-transfer mechanism, which is operated by an additional movement of the rotor clearing lever on the left-hand side. The lever is pulled forward beyond its normal stop (against an additional spring), and the result is transferred back to the rotor as the accumulator is cleared. The machine illustrated is one of several that were still in everyday use in the accounting department of the Australasian Temperance and General Mutual Life Insurance Society Ltd ("the T&G") in the early 1970s. 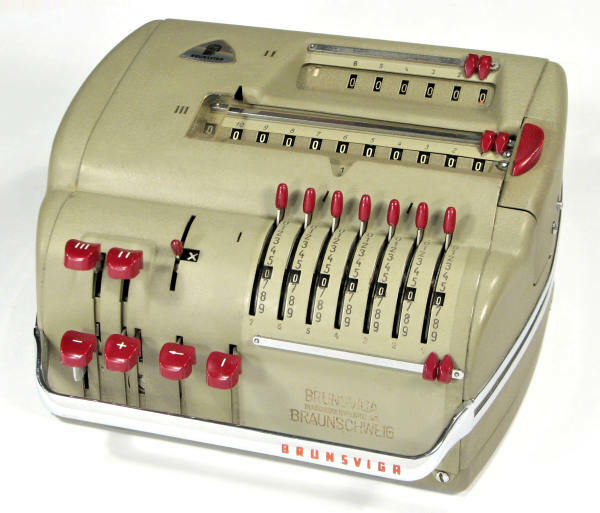 The Model 13B from the 1950s was Brunsviga's basic (and relatively) low-cost machine. It includes the tens-carry mechanism on the counter, and has a rotor clearing lever on the left-hand side. There is no setting check dial, no carrying handle, and no back-transfer mechanism. Unfortunately the "modern" plastic used for the numeral wheels in these small machines tends to shrink and distort with age. As the wheels are positioned laterally by the rim rather than by the hub, the distortion can sometimes lead to unreliable operation of the tens-carry and clearing mechanisms. 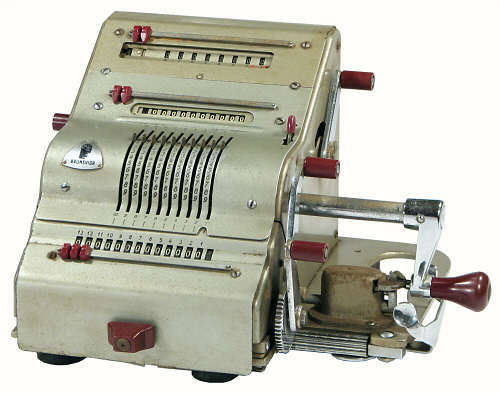 The "double" pinwheel machine, also known as the "twin" or "duplex", was developed by Brunsviga in around 1930. Its main purpose was to assist in calculations involving the conversion between rectangular and polar coordinates, particularly in surveying applications. This "double 13R" is essentially two standard but inter-connected 13R machines mounted side-by-side on a common baseplate. The two carriages are coupled together and move as one, but there are separate clearing controls for each register. To pre-set a dividend the numbers can be entered directly into the accumulator through a set of small rubber-tyred wheels at the front of the carriage. The levers at the lower left of each carriage section release the accumulator detents to allow the dials to turn more easily. The rotors and counters of the two machines can be set individually to rotate in the same or opposite directions. There is a single rotor clearing lever on the left-hand side, which also engages the back-transfer mechanism. The counter clearing levers can be coupled to clear the corresponding rotor in the same manner as the "K" machines, but there is no master clearing control. A common surveying problem involves measuring a series of angles and distances around a closed perimeter. These are converted to north-south and east-west distances, which should each sum to zero on returning to the starting point. To convert a distance and angle (r,Θ) into (x,y) coordinates the sine and cosine of the angle are set on the two rotors (from a book of tables, usually to 5 or 8 figures), and are multiplied simultaneously by the distance (via the turns of the crank). By setting the directions of rotation according to the quadrants of the angles, the results of the series of measurements can be accumulated automatically with the correct signs. 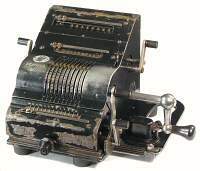 The Brunsviga 13RM is a late-model machine in the traditional Odhner format, with both the counter and accumulator registers in the moving carriage at the front. The machines were built by the Olympia factory in Spain from 1964 until the close of production in around 1970. This particular machine was housed in a heavy wooden carrying case and was used for field work by surveyors from the Department of Main Roads in the state of New South Wales. The 13RM has die-cast alloy covers in 1960s styling, but the mechanism is still built in traditional Brunsviga fashion with plenty of cast iron and brass. The machine has a check register above the setting levers, a rotor quick-clearing lever at the right-hand rear, an Odhner-style back-transfer mechanism, and tens-carry with automatic reversing on the counter register. A lever at the top left of the machine indicates the counter direction, and allows for manual setting. The counter tens-carry mechanism uses an odometer-style register with a set of cam-driven pawls to assist with ripple carries. All of the operator controls are on the right-hand side to allow one-handed operation. The Brunsviga Model 10 is a full-function rotary calculator which is small and light enough to be carried in a briefcase. Although it uses pinwheel-style setting levers, the internal mechanism is actually based on the bi-quinary stepped drum. The setting levers operate pressed-metal cams and rocking bars to position the pairs of drums along the drive shaft, in a similar manner to Frank Baldwin's Monroe mechanism. 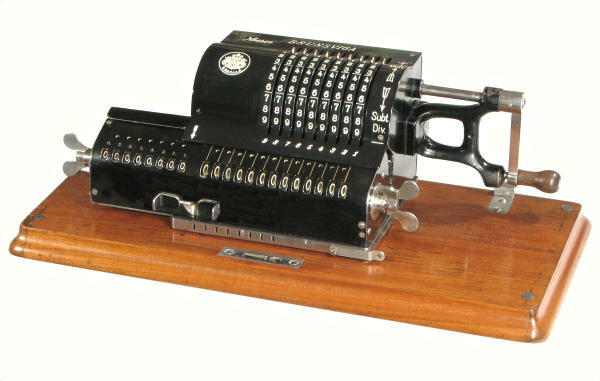 The Model 10 was designed by Richard Haase in 1932, and is described in his US Patent 2042986. The machine has a number of features which make it very simple and easy to use. The setting lever positions are marked in the usual manner, but there is also a row of windows at the "7" position to give a straight-line readout of the setting. A "0" button at the front right-hand side provides an immediate reset of all the levers. The carriage is located at the top centre of the machine, and is spring-loaded towards the left. It can be drawn 4 places to the right at the start of a calculation, and is returned one place at a time by a touch of the escapement lever next to the winding handle. The handle uses a bevel drive to bring it to a convenient angle. 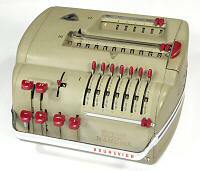 The 5-digit counter register at the top of the machine has full tens transmission to enable short-cut calculations. 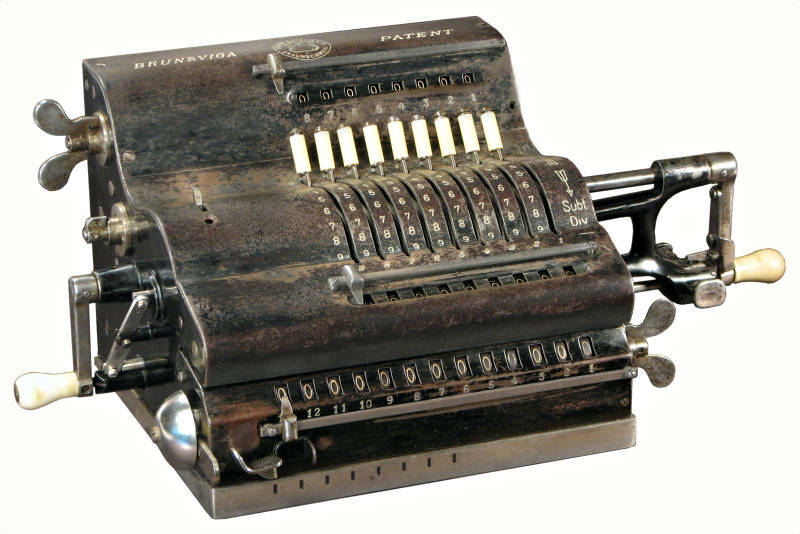 The double-width numeral wheels in the counter register have the numbers and their complements marked side-by-side, with an automatic sliding shutter to select the appropriate set. A fold-out stand raises the rear of the machine during operation, and can be locked away for transport. 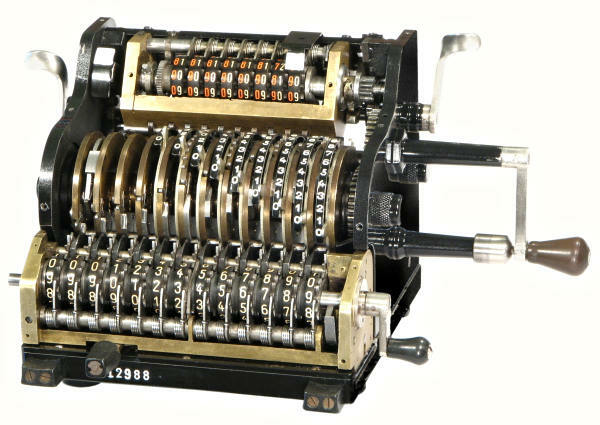 Model 11E is based on the Model 10 stepped-drum mechanism, with an additional digit in each register, a re-styled casing, and an electric motor drive. Function keys are provided for add, subtract, carriage left shift, and clearing of the three registers. 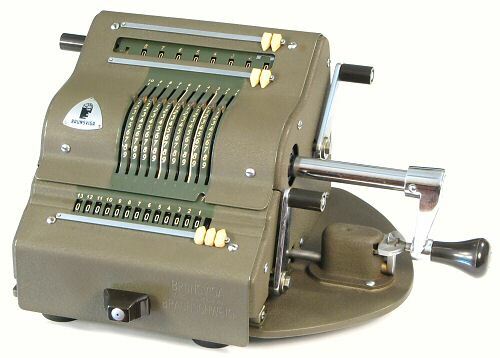 A three-position lever sets the machine for addition/subtraction, multiplication, or division. The first position will add (or subtract) and clear the setting levers, the second will retain the setting for repeated additions, and the third performs a semi-automatic division. 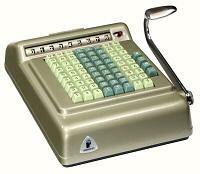 After setting up the dividend and divisor in the usual manner, a touch of the Minus key will subtract to underflow, restore, and shift the carriage to the left, leaving the first digit of the result in the counter register. The Minus key is pressed again for as many places as are required. The reversing of the mechanism for subtraction is accomplished without gears by reversing the rotation at the drive motor. The Plus and Minus keys toggle a two-pole switch which reverses the armature connections to the univeral motor. The motor has a friction-brake governor, rather than the conventional centrifugal governor and electrical dropping resistor. 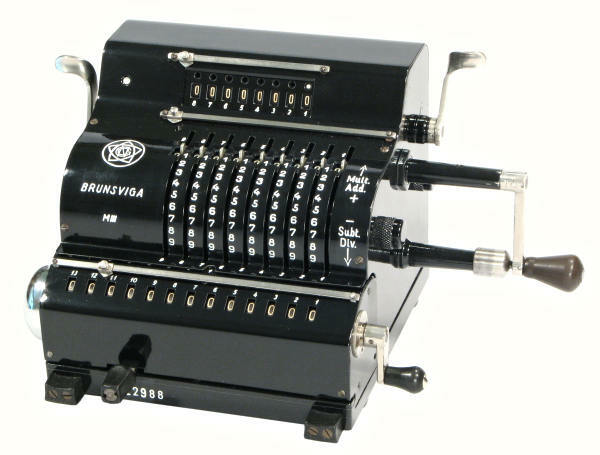 The Brunsviga Model 94T is a basic adding and subtracting machine in an attractive die-cast housing. The mechanism is based on reciprocating racks, driven by a downwards pressure on the operating handle on the right-hand side. There are only four control buttons - subtract, repeat, keyboard clear, and register clear. The machine is well constructed and easy to use, although rather noisy in operation. 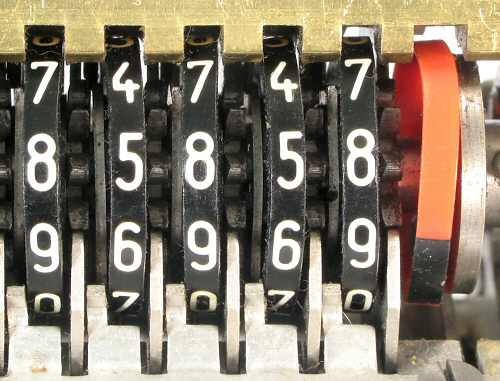 The double-width numeral wheels in the accumulator register have the numbers and their complements marked side-by-side, with a sliding shutter to select the appropriate set. 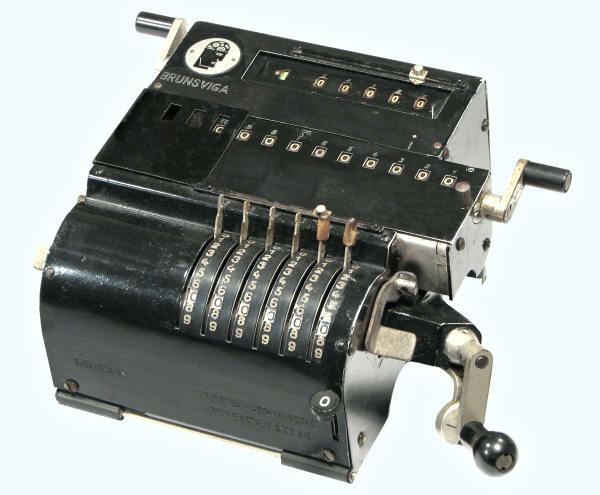 If the total in the register goes negative and displays leading 9s, the operator can slide the shutter to the left (via the small red lever at the top right) to display the true value on the complement digits. A Brunsviga Model 94T for Sterling currency, without Farthings. The keyboard has a full set of 1 keys in the ten-shillings column, and eleven (smaller) keys in the space of nine in the pence column. Operation is the same as for the decimal model. Brunsviga Adding Machine, Model 94T, carry bag. 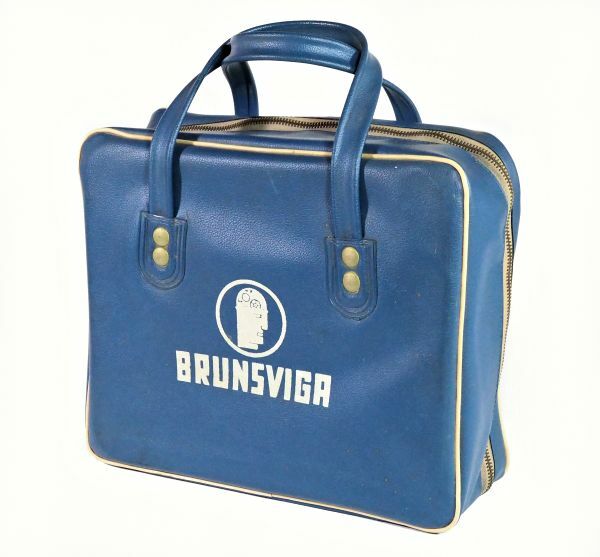 The Brunsviga 94T was available with an optional carry bag for portable use. The bag is well constructed from heavy vinyl-coated fabric with white edging, rivetted handles, and a zip fastener around three sides. 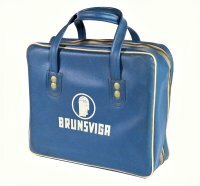 It carries the manufacturer's name and the "Brunsviga man" logo on the top side. 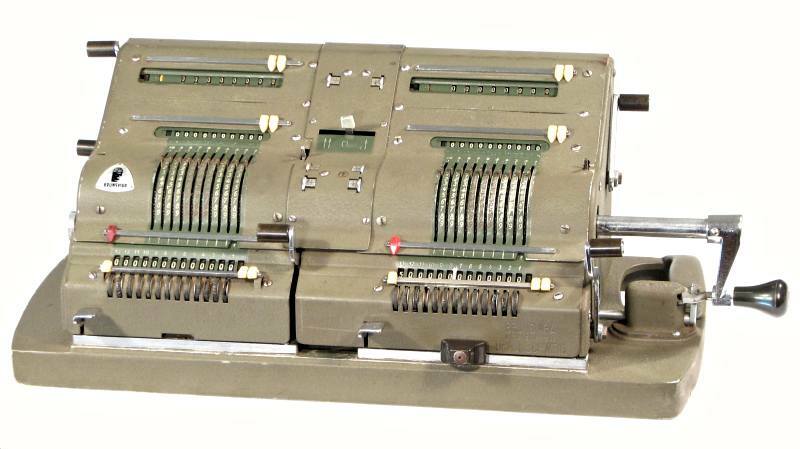 Model 894 is a substantial but rather basic ten-key adding and listing machine for decimal currency. The 89-series was introduced in the 1950s, and continued until superseded by the Olympia models in 1959. The machine illustrated was built around 1958. The GNC logo embossed into the front panel of the Model A Brunsviga. The well-worn GNC logo from the top of the Model J Brunsviga. The updated GNC logo used on machines from 1921. Some models from 1925 had the words "Nova Brunsviga". 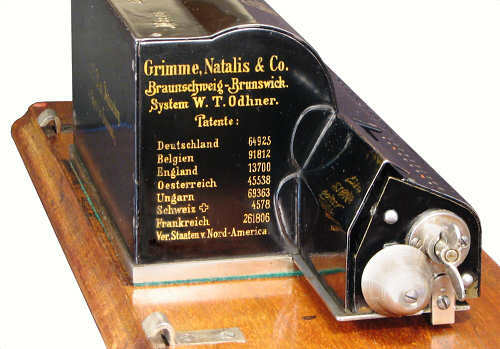 In 1927 the company name was changed to "Brunsviga Maschinenwerke Grimme, Natalis & Co AG", and the full title was embossed into the front panel of the carriage (at the lower right-hand side). The serial number (and sometimes the model number) were on the left-hand side. The "Brunsviga man" on a triangular metal plate first appeared in the 1930s. The plate was fastened to the front of most models through until the end of production. "Brunsviga man" often appeared in advertising and instruction manuals under the banner "Brains of Steel". The post-war nameplate of "Brunsviga Maschinenwerke AG", usually attached to the rear of the machines. 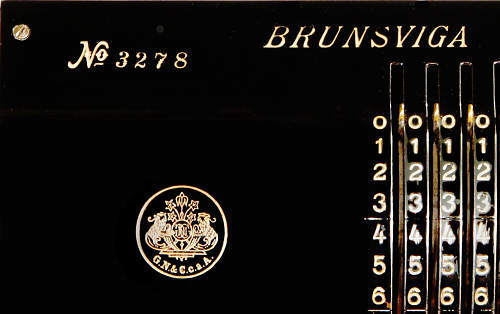 An "Olympia - Made in Spain" nameplate from a 1960s Brunsviga 13RM. Readers of German will find further historical information in the Brunsviga pages at www.rechnerlexikon.de. Original text and images Copyright © John Wolff 2002-17.